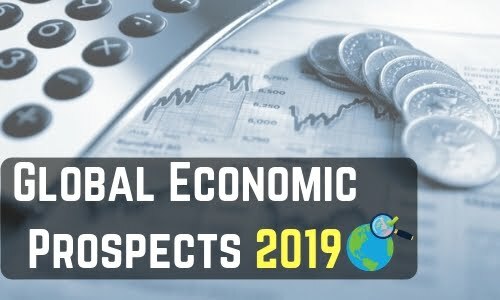 Global Economic Prospects is a World Bank Group flagship report that examines global economic developments and prospects, with a special focus on emerging market and developing economies. It is issued twice a year, in January and June. The January edition includes in-depth analysis of topical policy challenges while the June edition contains shorter analytical pieces. It is released under the title of “Darkening Skies”. The report states that global growth is expected to slow down to 2.9% in 2019 and 2.8% in 2020. Global growth is moderating as the recovery in trade and manufacturing activity is slowing down. The tightening of global financing conditions, or the recent appreciation of the US dollar, could slow down the economic activity in the emerging market and developing economies (EMDEs), including in those with large current account deficits. Brexit appears as a possible risk for countries that are especially reliant on selling to Europe. China's economic growth is projected to slow down to 6.2% each in 2019 and 2020 and 6% in 2021. Slower growth in China can affect developing countries that export industrial commodities, energy and metals to China. In 2017, China with 6.9% growth was marginally ahead of India's 6.7%, mainly because of the slowdown in the Indian economy due to demonetisation and implementation of the Goods and Services Tax (GST). Emerging market and developing economies should rebuild policy buffers by boosting human capital, promoting trade integration, and addressing the challenges associated with informality. India will continue to be the fastest growing major economy in the world. GDP is expected to grow at 7.3% in the fiscal year 2018-19, and 7.5% in the following two years, attributing it to an increase in consumption and investment. Domestic demand has strengthened under the structural reforms such as the Goods and Services Tax (GST) harmonisation and bank recapitalisation. The introduction of the GST and steps toward demonetisation can encourage a shift from the informal to the formal sector. Strong domestic demand can widen the current account deficit to 2.6% of GDP next year. Inflation is projected to rise above the RBI’s target range of 2 to 6%, mainly owing to energy and food prices.